Official data from over 100 indicators, revealing patterns in poverty and inequality. The latest data for London's Poverty Profile shows a mixed picture in London. In some ways, London is better off than it was before the financial crisis. Employment rates are at their peak, at least as far back as 1992, at over 73% of the working-age population. This is 4.5 percentage points higher than a decade earlier. This also translates to a record low in the number of workless households in London. However, while the overall poverty rate has fallen slightly in recent years, it remains higher than the rest of the country; and the proportion living in 'deep poverty' has increased. 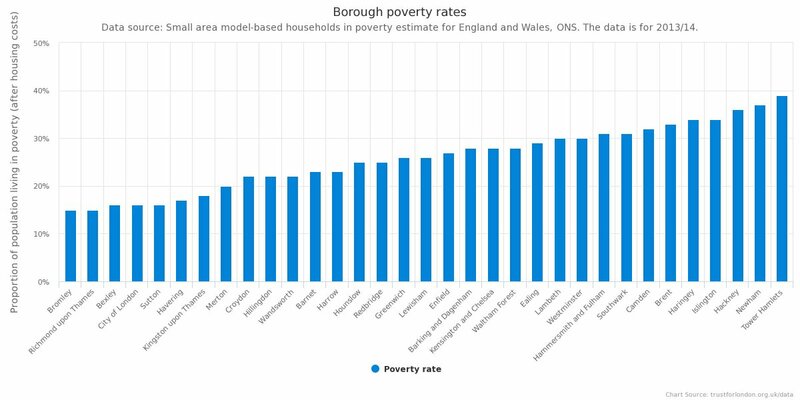 You can see more key facts about poverty and inequality London here. of Londoners are living in poverty (after housing costs) - down from 29% six years ago. In the rest of England it is 21%. of London's wealth is owned by the top 10%. The bottom 50% own only 5% of London's wealth. of Londoners in poverty live in a working family. This equates to 1.3 million people - a 50% increase over the last decade. 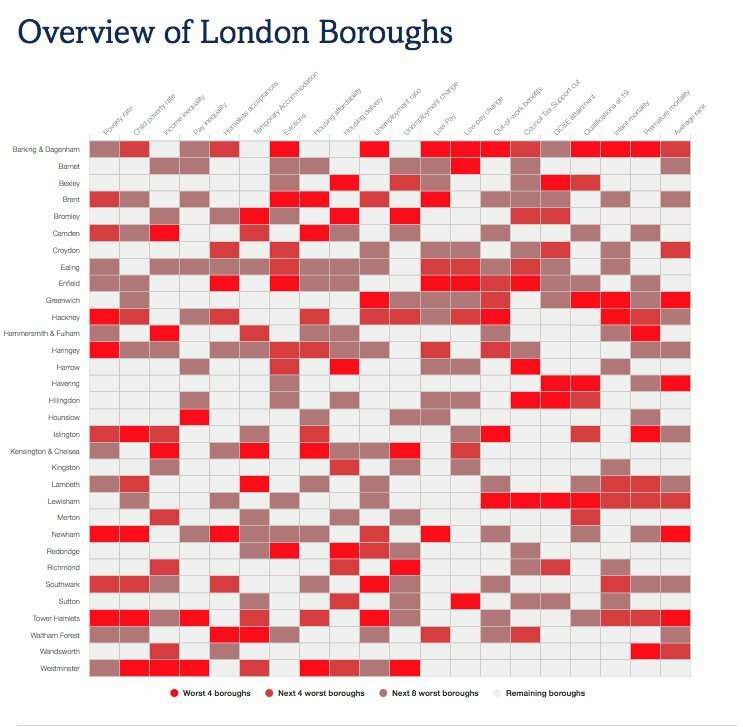 Compare across 19 different indicators and see overall rankings by borough. Out of work benefit claimants ? Attainment at age 16 ? Free school meal attainment at age 19 ? Median real weekly earnings ? Households with no adults in paid work ? Unemployment for young adults ?